or simply a visitor, here’s . . .
How would you characterize Saint Paul? Do the words “venerable” and “dignified” usually come to mind? That’s fine, but what about “playful” and “quirky”? 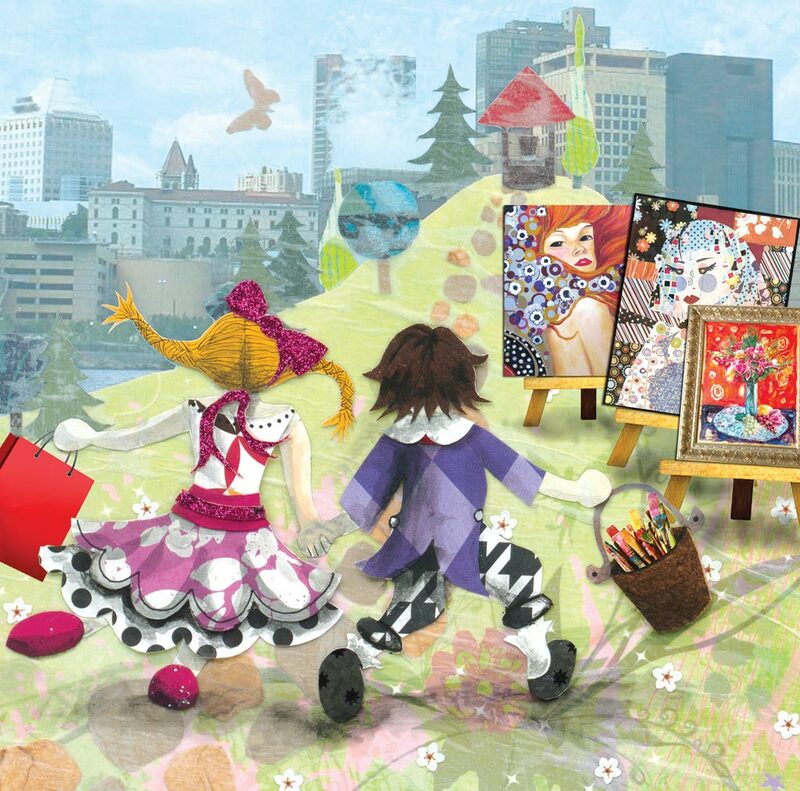 Okay, before you start thinking, C’mon, where’s this going, I’ve got things to do, let me quickly add that my art tour is a mere sampling of what Saint Paul has to offer. Not to mention, it may surprise you. What’s more, every stop on my little tour is free. North High Bridge Park (on Smith Avenue at entry to High Bridge): Look for the oversized (and that’s putting it mildly) Adirondack chair. “Green Chair” (artist: Joel Sisson) appears all the more ­giant-like sitting in such a tiny charming pocket of a park. And as domineering as this 2,500-pound chair is, you can’t resist staring at “The Watcher” (artist: Zoran Mojsilov), a gravity-defying, curvy pile-of-stones sculpture that looks like the remains of some prehistoric animal’s tail, frozen mid-lash. Nor would you want to leave this park without stepping through “Community Gates” (artist: Craig David), a contemplative, Stonehenge-like garden created in part (and I love this) from leftover pavers and curbstones. The bonus? This wee park sits right atop the bluffs, so you can look down on the activity on the Mississippi River. Western Sculpture Park (on Marion Street off of I-94): Hard to miss any park with a rabbit just sitting there, boldly staring at you. That is, if you, too, are 14 feet high. 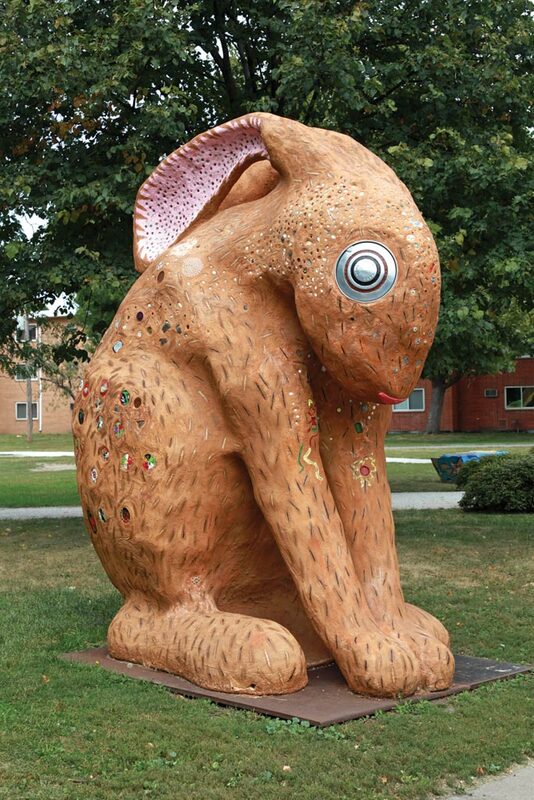 “Max Rabbitat” (artist: Mary Johnson) is not your usual 4,000-pound rabbit with hubcap eyes, so get up real close. It’s embedded with delightful bits of yard-sale mundanity. Cookie cutters, puzzle pieces, clothespins—and I found at least one action figure and a spoon. Nearby, shooting up past the trees, is “Walking Warrior 1” (artist: Melvin Smith). This elegantly spare steel man looks like he stepped out of a cubist painting, then grew 33 feet high to loom over the park, as if guarding it. “Ah, to build, to build! That’s the noblest art of the arts . . .” said poet Henry Wadsworth Longfellow. 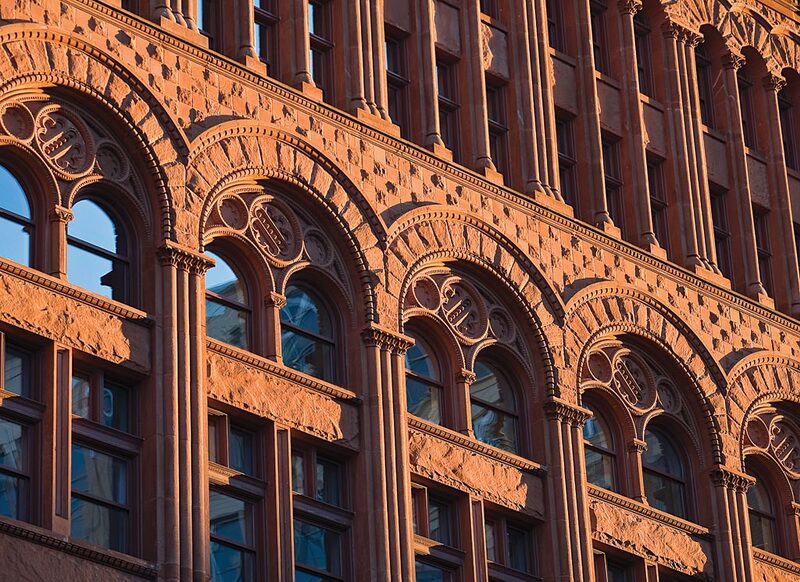 ­“Architecture is inhabited sculpture,” said sculptor Constantin Brancusi. And who’s going to ­argue with these guys? First, there’s Union Depot (on Fourth Street), followed by Merchants National Bank, now the Brooks building (on Jackson Street). Then scoot down Jackson to the Pioneer-Endicott building, the temporary home of the Minnesota Museum of Art, (featuring American artists, from 1860 to the present). Then, take in the most strikingly beautiful block in all of the Twin Cities (yes, not just Saint Paul): Rice Park, flanked by the Landmark Center, Saint Paul Hotel, Ordway Center for the Performing Arts, and the Saint Paul Public Library/James J. Hill Reference Library. And don’t forget to go inside. I can’t begin to describe the splendid detail of their interior spaces. Nature has inspired artists forever, so you can’t tell me that nature isn’t art, purely by itself. Well you can, but I won’t be listening. Massive cottonwood trees hang right over the river— trees that look like a giant tried to pull them out by the roots, but got just so far and gave up. Big old rocks (stone’s answer to beach chairs) are just a few flip-flop lengths from the Mississippi River, a surprisingly decent way to sit and watch barges, paddleboats, and ducks go by. I should know—I’ve been doing it for years. I never tire of it. So where is art in Saint Paul? It’s all around you. I like how writer Saul Bellow put it: “What is art, but a way of seeing?” Clearly there is so much more of it for you to see. And when you do and it ­delights you, tell others. Jody Huber lives in the fine Saint Paul neighborhood of Merriam Park. And while she grew up in Duluth, she spent years away in Houston, Texas, and Edmonton, Alberta, before she came to her senses and returned to Minnesota. She is a freelance advertising copywriter who loves to read just about anything, with a penchant toward female fiction writers from Great Britain, India, and Russia.